The public were left to decide the winner of the Iarnród Éireann Best Station Awards. AFTER A PUBLIC vote Ireland has chosen its best train station. Beating out the competition, Dundalk’s Clarke station was chosen as the winner of the overall best train station category at Iarnród Éireann’s annual Best Station Awards. To chose the winner, 4,000 customers rated their own stations in the categories of customer information, station appearance and staff helpfulness. Anthony Monahan and Martin Dullaghan, members of the team in Clarke station were at the Iarnród Éireann Inchicore Engineering Works earlier today to collect their awards. 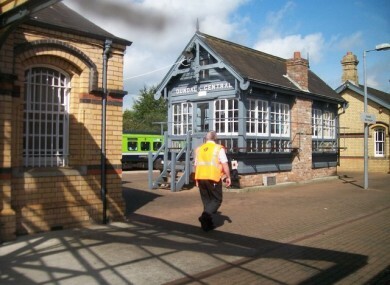 The station is named after Tom Clarke, one of the executed leaders of the 1916 Rising. The border county station has snatched the prize away from Kildare’s Hazelhatch & Celbridge station which took home the award in 2014.
Who else took home prizes? Around the country awards were given out to a number of regional winners. Millstreet station in Co Cork was awarded the title of best station in Munster and the Westport station in Co Mayo was given the award for the best station in Connacht. The best DART station was awarded to Malahide with Sandycove Glasthule and Dun Laoghaire highly commended. Dromod railway station in Co Leitrim took home the prize for the best customer service in Ireland. Public transport demand is picking up significantly, due to the number of people going back to work, and this is expected to continue in the years ahead. Email “The votes are in, and Ireland has chosen its best train station ”. Feedback on “The votes are in, and Ireland has chosen its best train station ”.